With growing demand from a client base of architects and main contractors for specialist support, Greenwood continues to expand its range of selected products. Latest to arrive is a range of access ladders, providing safe access specifically to high levels such as building rooftops. The ladders come with a protective cage to prevent those using them from the potential for falls from high levels. 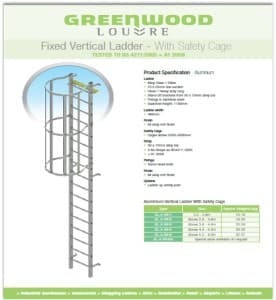 The ladders can be manufactured in aluminium or galvanised steel, with standard lengths up to six metres – and longer lengths possible to special order. The access ladders are ideal for safe access to high level rooftops such as those on lift motor rooms, or for accessing regular maintenance items such as building plant located on the rooftop.